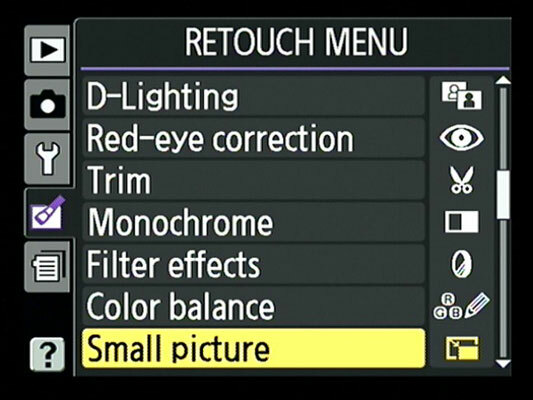 Press the Menu button and then display the Retouch menu. Select the Small Picture option and press OK. Highlight the size you want to use and press OK.
You return to the Small Picture screen. Choose Select Image and press OK to display thumbnails of all your pictures. Move the yellow highlight box over a thumbnail and press the Zoom Out button to “tag” the photo for copying. You see a little icon in the top-right corner of the thumbnail; press the button again to remove the tag if you change your mind. After selecting all your pictures, press OK to display the copy-confirmation screen. Highlight Yes and press OK once more to wrap things up.